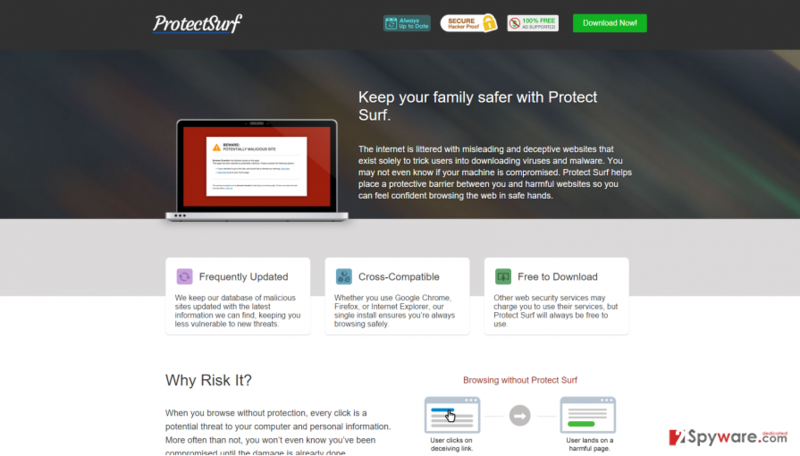 ProtectSurf is the PUP that uses misleading techniques to prevent removal. Use Reimage to locate malicious components and get rid of them faster than with uninstall instructions. A full system scan blocks virus reappearance and prevents traffic to malicious domains. Have you encountered ”Ads by ProtectSurf“ or ”ProtectSurf ads“ recently? Do you experience many pop-up windows while you browse the Internet? Has you computer slowed down noticeably? Are you bothered by such interruptions? If so, we will enlighten you about this potentially unwanted program (PUP) which causes these intrusive ads. Protect Surf is an application that is spread both through its official page and also with bundling method. Bundling is a way to seamlessly distribute PUPs – by attaching them to other, usually lawful programs that PC users download from the web. You may not notice that your preferred program contains optional apps, and the only way to find out if there are any attachments is to configure the installation settings. You can do that by choosing ”advanced” or ”custom” installation option. The configuration window will expand, and all you need to do then is to untick the agreements to install undesirable programs. Question: I have recently found this application called ”ProtectSurf”. I have two little kids who already use the computer, and I have thought that this application will be beneficial and will help to block dangerous websites so my children cannot enter them. However, I noticed that after the installation of it I started receiving various advertisements that do not look reliable! Moreover, they do link me to dangerous-looking websites. How can I uninstall this deceptive software? Answer: You have installed a ProtectSurf virus, which is not a trustworthy tool at all. You should remove it as soon as possible to prevent any risks for your computer. You can uninstall this program manually – we have provided the step-by-step instructions below this article. However, if you do want to actually take care of your PC’s security, you should install an anti-malware program, which will detect and uninstall potential computer threats, also it will block any processes that attempt to secretly auto-start malware entries by exploiting the Windows registry. Here, look for ProtectSurf or any other recently installed suspicious programs. Wait until you see Applications folder and look for ProtectSurf or any other suspicious programs on it. Now right click on every of such entries and select Move to Trash. When in the new window, check Delete personal settings and select Reset again to complete ProtectSurf removal. Once these steps are finished, ProtectSurf should be removed from your Microsoft Edge browser. Here, select ProtectSurf and other questionable plugins. Click Remove to delete these entries. Now you will see Reset Firefox to its default state message with Reset Firefox button. Click this button for several times and complete ProtectSurf removal. Here, select ProtectSurf and other malicious plugins and select trash icon to delete these entries. Click Reset to confirm this action and complete ProtectSurf removal. Here, select Extensions and look for ProtectSurf or other suspicious entries. Click on the Uninstall button to get rid each of them. Now you will see a detailed dialog window filled with reset options. All of those options are usually checked, but you can specify which of them you want to reset. Click the Reset button to complete ProtectSurf removal process. This entry was posted on 2015-10-13 at 00:33 and is filed under Adware, Viruses. You can quickly scan the QR code with your mobile device and have ProtectSurf ads manual removal instructions right in your pocket. How did you remove ProtectSurf ads?